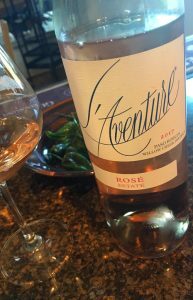 2017 L’Aventure, Estate Rosé, Stephan Vineyards, Willow Creek District, Paso Robles. Crafted by the Saint-Emilion native Stephan Asseo, the L’Aventure Estate Rosé is to California what Domaine Tempier is to Bandol, it is one of the state’s finest dry Rosé wines and a cult pink if there ever was one! This vintage the blend is made up of 37% Grenache, 30% Syrah, 26% Mourvèdre and intriguingly with 7% Petit Verdot as well, it is completely and crisply dry and powerful in intensity and mouth feel, but with sharp detail and mineral charms, it really put a focus on the talented winemaking and growing to produce such an amazing pink! Asseo, who began making wine in 1982, following his education at L’Ecole Oenologique de Macon, Burgundy, France, created a small Bordeaux, Domaine de Courteillac he he made the wines, but then his family took over the famed Chateau Fleur Cardinal in Saint-Emilion and he was put on the team there, though he longed for adventure and a place where he explore his craft outside the very rigid structure and expectations in Bordeaux. After searching for over a year among the world’s great regions, including some exotic and far away locations, from South Africa to Lebanon, and Argentina to Napa, Stephan found and fell in love with Paso Robles, at this in the nineties a remote and wild region with unbelievable and undiscovered potential. He first did a Zinfandel from purchased fruit to tide him over until he could get his virgin estate up and running with a mix of Rhone and Bordeaux varietals of which he makes some of California great wines, including this awesome Rosé. Being a maverick, he left his preconceived ideas behind in France and has embraced California fruit and the freedom to express it the way he wants without AOC rules getting in the way, he could never made a blend of Cabernet Sauvignon, Syrah and Petit Verdot at home on the right bank, but here he can and does with distinction and verve. The Estate Rosé is a delicate shimmering pale wine with a touch of orange in it’s pinkish hue and the nose has a chalky tone and light floral note before leading to a rather bold and full palate of exciting layers of tart cherry, strawberry, watermelon and candied citrus along with touches of sage, lavender, rosewater, mineral and a hint of savory spice. At 13% this vintage of L’Aventure Estate Rosé is not overly ripe or too hot, this is serious stuff that thrills from start to finish and is especially good with robust food choices and simple cuisine, though I can imagine experimenting with spicy sea foods and think it would be great with mixed shellfish, like mussels and clams in tomato and wine broth. Stephan Asseo’s Estate Rosé easily makes into the top ten of California Rosé with the likes of Randall Graham’s Bonny Doon, Arnot-Roberts, Ian Brand, Tribute to Grace and Skylark to name a few, this is a must have for the pink enthusiast.